View from the campsite on Enemat. Leaving Majaro on the way to Kwajalien. 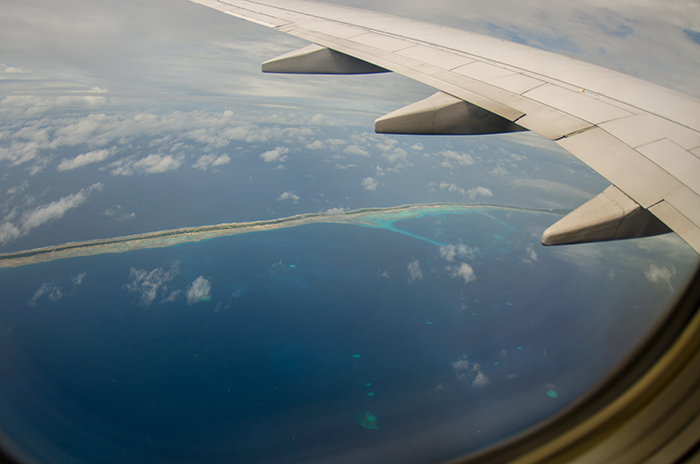 After meeting DJ at the airport in Honolulu at 3 am we boarded the flight for a 5 hour trip to Majuro and then a 1 hour flight to Kwajalein Island, simply called “Kwaj” by the locals. The Kwajalein Atoll is one of the worlds largest atolls with 97 islands and islets surrounding one of the largest lagoons in the world. Practically this translates into lots of long, thin islands stretched across the ocean. Kwajalein Atoll is approximately 2,100 miles southwest of Hawaii and 1,400 miles east of Guam – pretty much in the middle of nowhere, but this particular nowhere has storied military significance. In 1944, having become a Japanese stronghold, Kwajalein was the target of the most concentrated bombardment of the Pacific War: 36,000 shells from naval ships and ground artillery hit one small island. After the war, the US used the island of Kwajalein as the main command center and preparation base for 67 nuclear blast tests on nearby Bikini and Enewetak atolls. Between 1945 and 1965, all the native peoples of the atoll were forcefully moved by the US military to the small island of Ebeye. Today an estimated 11,000 – 17,000 people (half are children under 12 years old) live on one 80-acre island (roughly 1.5 miles long and 800 feet wide.) To this day, the base on Kwajalein is considered critical to US missile defense, and the primary employment for those living on Ebeye is working at the US military base. Between North Loie and Eboj. The airport on Kwajalein is part of the US military base, and the three of us had no idea what to expect when getting off the plane. As it turns out, you can’t just go to the island of Kwajalein, it is all military, and the island is not set up to process tourists. Most times when you get off an airplane you are greeted with air conditioning, baggage claim, and ground transportation; in Kwajalein you are greeted by big soldiers with guns and guard dogs that don’t look too happy to see you. All the passengers were ushered into a large room where we were told to fill out some paperwork on a clipboard under our seats, then processed by two men at podiums. “You’re TDY?” they said to us. “We don’t know what that means” we replied. “TDY?” they repeated. “We are staying on Ebeye” we tried. They nodded, put a pink card in my passport, and waved us through. Without knowing what to do, we followed the other passengers to another room where we waited for our luggage and said ‘Ebeye’ to someone official looking who then pointed us to a bus filled with Marshallese people. A 5 minute bus ride later we arrived at the checkpoint where our pink cards were removed from our passports, our passports were not stamped, we went through the checkpoint and into the waiting area for the ferry that would take us to Ebeye. More importantly, in the waiting area was Conor, who knew how things worked and could tell us what to do, and the first thing he told us to do was wait for 3 hours for the next ferry. 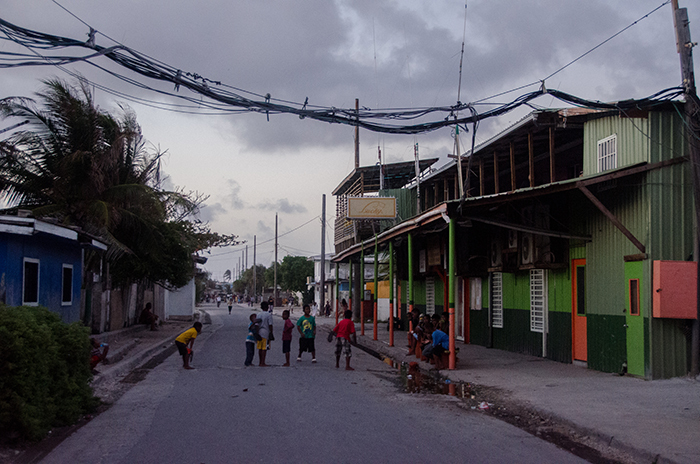 A general view of life in Ebeye; kids all over the streets at all times of the day and night. Softball field next to the trash dump on Ebeye. Inside of the sail boat, incredibly small and hot. The next day, we prepared to board a sailboat to go to one of the outer islands, Enemat, the ancestral home of Conor’s family. This trip was even harder to prepare everything for because of ‘island time’ combined with the number of people that wanted to come on the trip with us. Interestingly, the trip was initially supposed to be for 3 nights, but, well, ‘island time’. Connor, who had never been to the island, his Mother Helen, who hadn’t been to the island in 30 years, a Brother Alex (one of the most awesome people we have ever met, he looks like he eats rocks), the boat captain and his first mate, and the three Americans all prepared to get into a sailboat and head northwest. We needed to pack all the dive gear, get tanks, negotiate the boat rental cost, buy enough supplies for the trip and then get everything to the dock and on the boat. We got a late start, and the boat seemed too full of gear and people, but figured we would get there in time for an afternoon dive, after all it was only a 3 hour trip. At the 3 hour point when Helen said ‘halfway there’ we all had to rearrange our expectations. Anchoring in the cove near our campsite, it became clear that the trip was well worth it. Before we had anchored, Alex had jumped from the boat and began a lumbering swim to shore; he loves the island and wants to be there whenever he can. It is hard to remember that the local people are not allowed to live on their ancestral island homes because of the Land Use Agreement they have with the US, and because of the danger of falling debris when missile defense systems are being tested – when that happens everyone has to stay on Ebeye or Kwajalein itself. As it was getting close to sunset, we jumped into the water with our snorkel gear to take a quick look around before the light faded. 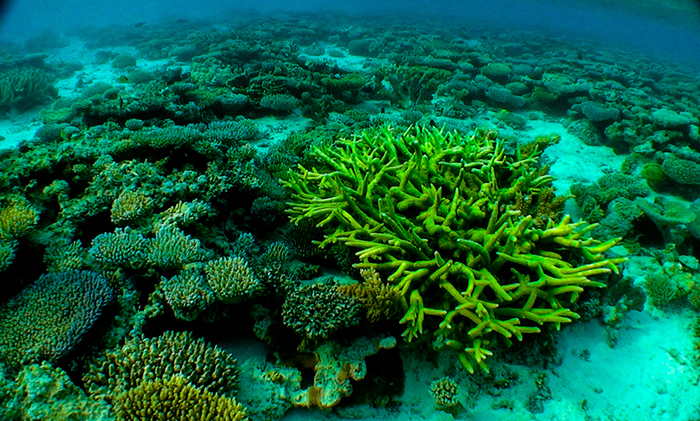 Coral geek paradise! 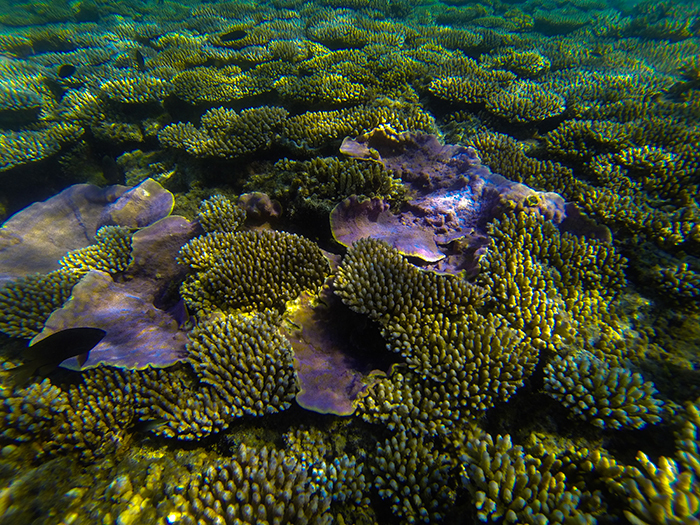 Acropora in all shades and colors everywhere, tons of schooling bait fish, the most amazing Tridacna maxima clams, and a couple of Black Tip reef sharks patrolling the area looking for an evening snack. It was only when it started to get too dark to see that we left the water to set up camp. Alex had spent the time we spent in the water clearing away debris so we could have room to spread out our tents and travel hammocks. We all went into the jungle to cut down palm fronds to make beds for Conor, Alex, and Helen (while the boat crew slept on the boat), and the fronds ended up being surprisingly comfortable. Then we set about collecting Nerite snails for dinner, keeping the coconut husk fire going and keeping the large hermit crabs from taking over the world. 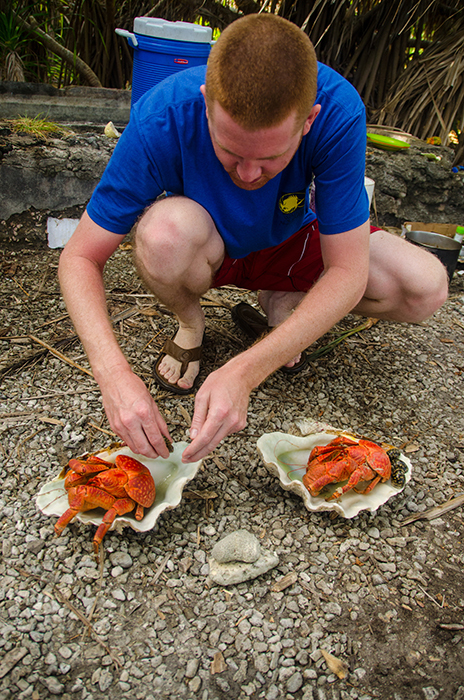 After dark, the Americans were exhausted, but the Marshallese ventured out into the jungle to collect the island’s delicacy, Coconut Crab (Birgus latro). These huge hermit crabs without a shell can grow up to 1 meter across and are sometimes locally extinct as people harvest them to celebrate special occasions. The two that were found that night were more than a foot across and tasted delicious with garlic butter. 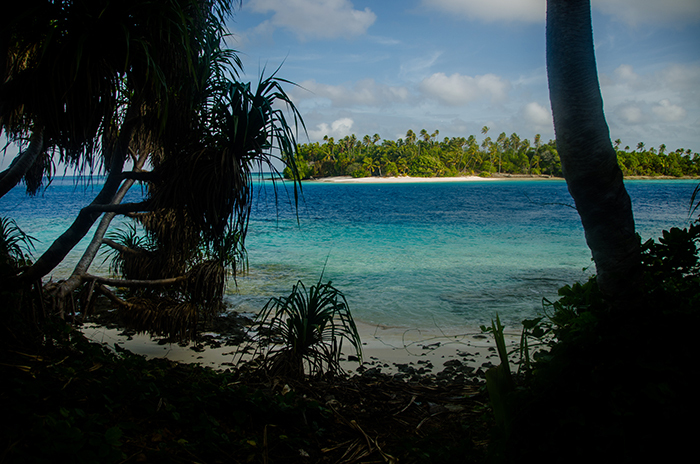 We feel asleep eager to get up early to dive in the morning so we could get back to Ebeye before dark. Two coconut crabs waiting to be eaten. The next morning, we woke and the boat was gone. We were told it would be back in an hour, but we were hip to the Marshallese version of island time. We ate some leftovers and then DJ and Rich snorkeled across the channel to scout out the morning’s dive. The reef off of the adjacent island, Enero, had a protected cove that was filled with a large diversity of corals, and as we swam across in our dive gear we were treated to a fly by of a spotted eagle ray. During the dive we saw large and brightly colored Orange Spotted Filefish (Oxymonocanthus longistrosis) pairs and a huge pair of Emperor Angels (Pomacanthus imperator) inside a coral outcropping that also turned out to be the home of a huge, really huge, grouper that seemed to want to charge Conor. The boat was back and had caught fish, and Matt noticed that small black tip sharks were eating the leavings, so we collected left over fish parts and fed them to 5 little sharks before breaking camp and sailing back to Ebeye. Even though we got a late start, we were making good time until the Captain woke from his nap to discover we had gone 20 miles in the wrong direction which meant that we got to experience the glory of an unpolluted night sky from the deck of a sailboat out in the middle of the Pacific. Diving and Snorkeling The next day, after Matt and Conor had a long negotiation over getting tanks filled and when to pick them up, we went to a shallower fish collecting spot, and had a great time searching for tiny, hard to spot, hard to catch wrasses that were essentially impossible to get on photo or video. It was wonderful to watch these fish working to avoid us by using all the tricks that they evolved to avoid predation in their natural habitat. On our last day of diving, island time was in full effect. We were supposed to go out diving on a big boat with a friend of Conor, but around noon it became clear it wasn’t going to happen. We were so worn down from trying to figure out how to make it happen that we were almost resigned to watching a UFC fight on the poor-reception-ridden Armed Forces Network Channel. We were saved by fate; the electricity turned off and we were forced to go out snorkeling. We were able to find a cab that took us north 3 or 4 islands on the poorly maintained causeway to a space between the islands of between North Loie and Eboj where a rusted out excavator stood guard over one the most amazing spots we were to visit the whole trip. 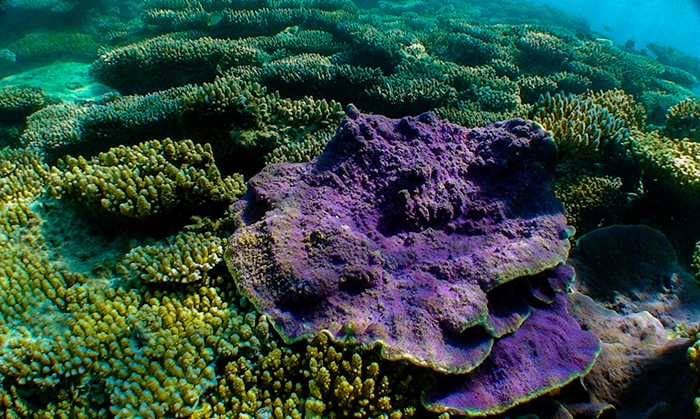 Tabling and branching Acropora, bright purple Montipora, and thick clouds of parrot fish were everywhere and we realized that this kind of habitat must extend around the entire atoll, and that we would gladly spend years exploring it all if possible. Connor on his way to collect some fish. 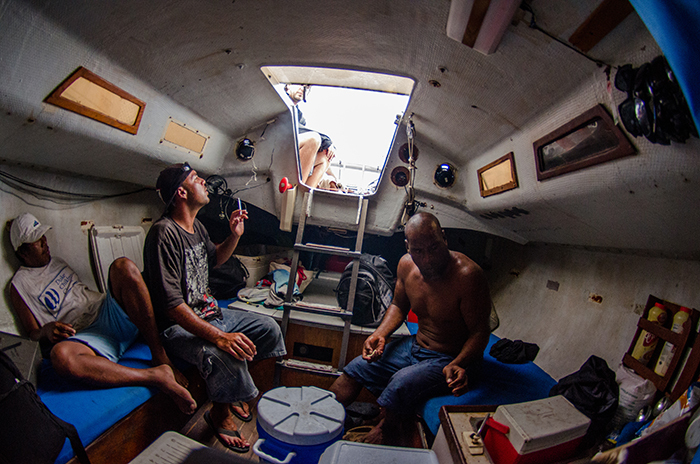 We didn’t have to be at the ferry until 3pm, so we rose the next day, jumped on Conor’s boat and headed to an area between the islands of Kwajalein and Wripib. This area sees a lot of water motion as the tide goes in and out, so though we expected there to be a lot of life, we were yet again blown away by what we saw. 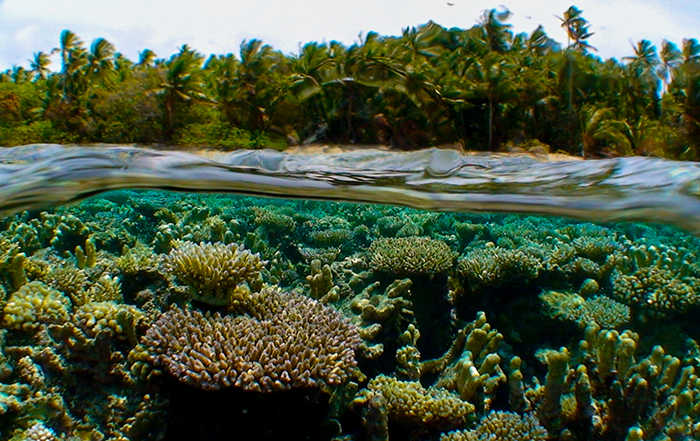 Between fjord like outcroppings covered in small tabling Acropora were fields of staghorn Acropora that seemed to go on forever while white tipped sharks and schools of thousands of convict tangs (Acanthurus triostegus) went about their daily lives. 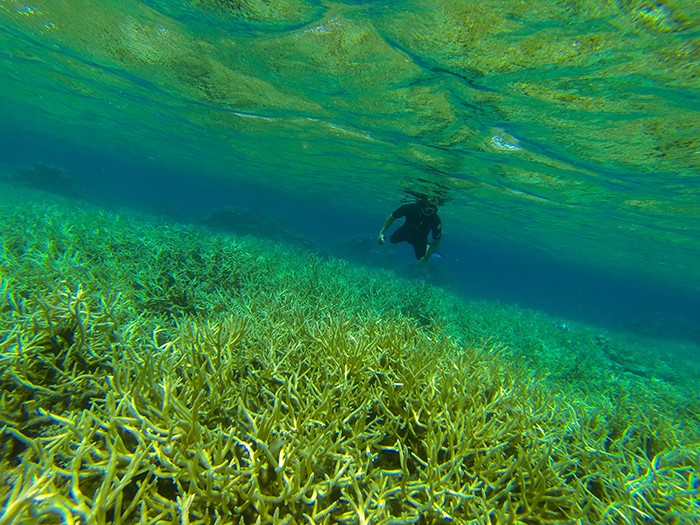 Fields of Acropora between Wripib and Kwaj. Realities on the Ground One example of how alien Ebeye can be to Western sensibilities: Before we left for the ferry that would take us back to the military checkpoint on Kwaj, we took a few minutes to walk over to the back side of the island’s garbage dump where old vehicles and machinery is discarded, piled high, flowing off the land and stacking up in the shallows – with nice coral shoals not 10 meters away. 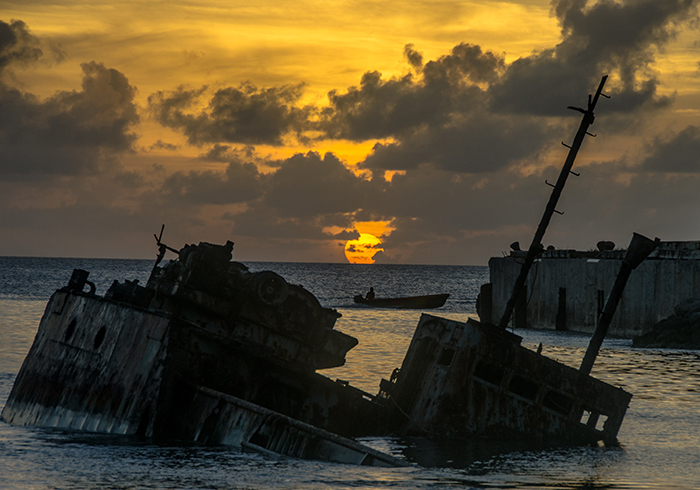 Children use the rusting machinery like playground equipment, playing in the abandoned vehicles and jumping into the sea from their heights for fun. 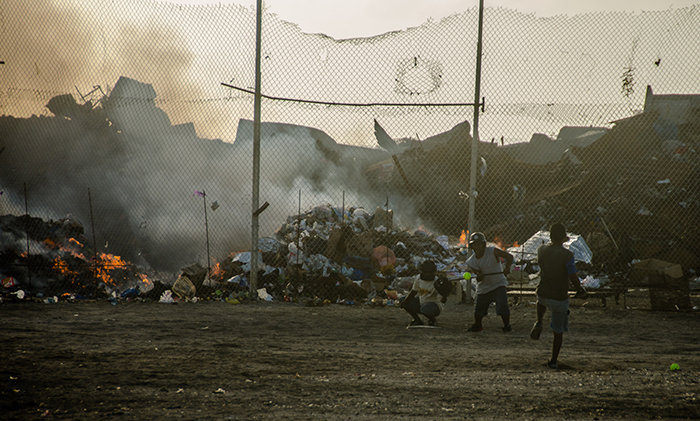 The garbage dump itself is also used as a playground by kids and adults alike, as the softball field directly abuts the dump, giving a softball game a surreal backdrop of smoke and fire. 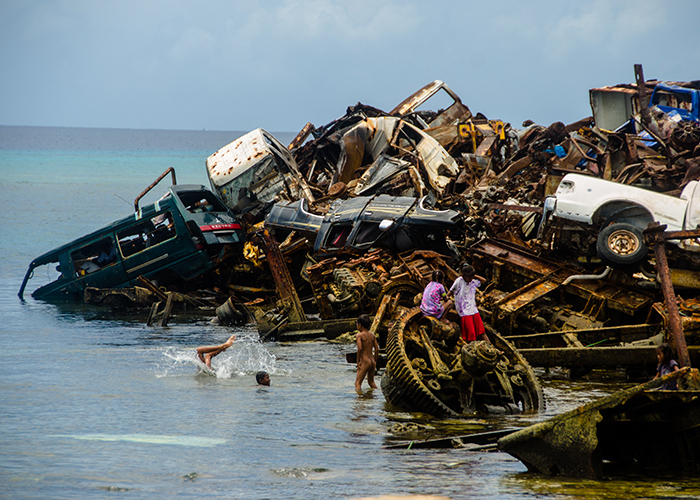 Children playing in the junkyard just off the island of Ebeye. Like we mentioned earlier, there are a lot of children on the island, since there is not much space on the island with so many people there aren’t all that many places for children to be children. Besides basketball courts, which come in all shapes and sizes on Ebeye, the children are playing everywhere at all times of the day. The realities of life in Ebeye are still sorting themselves out in our heads. 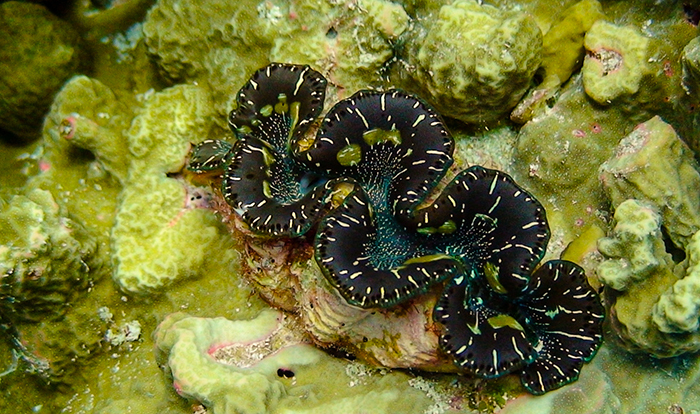 It was very strange to juxtapose the clean and manicured US military base filled with American families and a small town feel with the crowded, third world Ebeye just a walk across exposed reef at low tide. We couldn’t help but feel that it would be so easy to make the living conditions on Ebeye better, but of course, the situation is complicated. Should You Go There? If you can, yes, but it isn’t so easy. 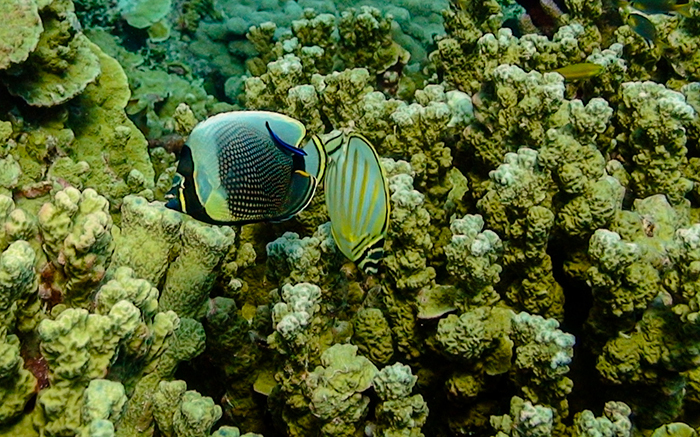 The reef life around Ebeye and across the Kwajalein Atoll is fantastic – definitely in the top 8 diving trips any of us have ever been part of. However, you can’t just jump on the internet and make arrangements to go visit. Besides one hotel, there is no tourist infrastructure at all. 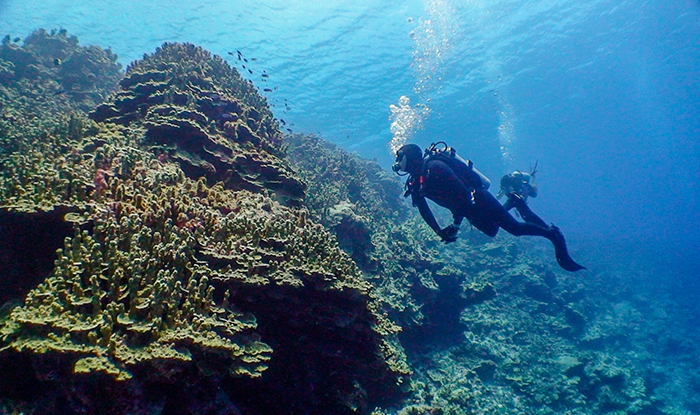 If it weren’t for our local connections, we don’t see a way that any of our underwater trips, or our lodging, could have been accomplished. Even those connections couldn’t help us in every situation. Sometimes the few stores on the island were just closed, so we stayed thirsty until something opened because the tap water isn’t safe for us to drink. We almost didn’t get through the checkpoint to get back home because there was no way for us to know that we needed our outgoing flight to be confirmed before we could get back on the US military base – and even if we did know, we couldn’t have gotten those numbers because internet was virtually non existent, and spotty when it was available. It took over an hour for the guards at the checkpoint to figure out how to get us through and we were lucky to make our flight home. If you are in the US military, or have a connection there, you might be able to get permission to go visit the base on the island of Kwajalein, but honestly, we don’t know any of the realities of that possibility. We would love to go back if we can. Now that we know a bit of the lay of the land, we think we might be able to effectively combat island time, and we also know what extra gear that isn’t easily available on the island to bring with us…like an extra gas can for the boat. 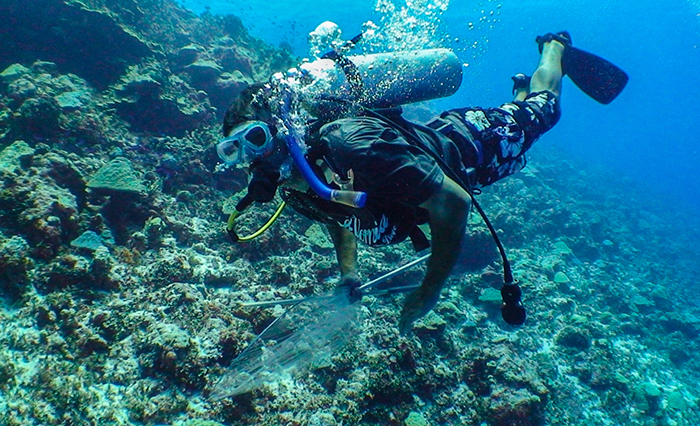 It would be great to help the few local collectors be more efficient at responsibly using the one natural resource that is available on Ebeye–the sea, and possibly bring attention to, and working to better, the lives of everyone on the island. Until then, we will continue to process the incredible adventure we were privileged to take to a part of the world few get to see, and a part of the world underwater that even fewer get to see. Montis and Acros between North Loie and Eboj.